Updated 9/24/2017 This Animation director was Katsumi Tamegai, who also did five other episodes (not the same ones as Sasaki). 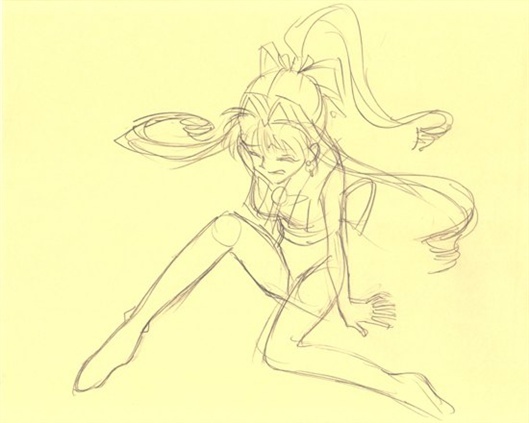 Tamegai, a more experienced artist, was credited with the “general animation supervision” for the series. The roughs from this episode do show a sharp-edged, expert touch, particularly in posing. When Jeanne tumbles painfully into Miyako’s trap-of-the-week, the situation required considerable expertise to make her pose look properly awkward but not anatomically impossible. Tamegai, a veteran of Boogiepop Phantom and Serial Experiments Lain (gengas), also did quite a bit of work on Sailor Moon and particularly on the various Precure (Pretty Cure) projects, including directing and doing character design for three of the movies.